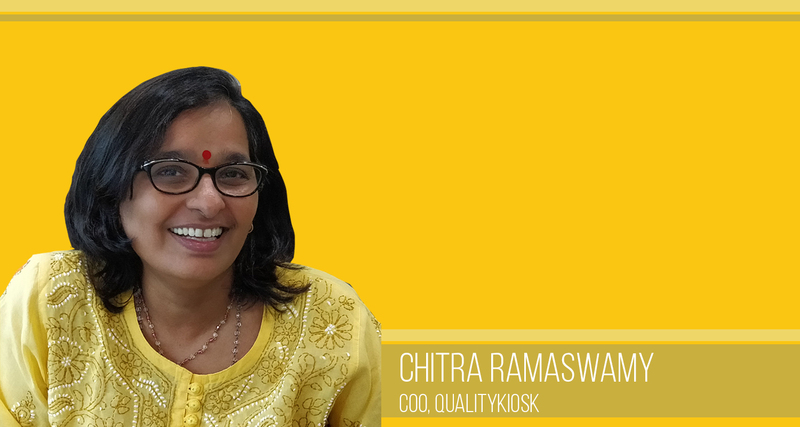 Heading the testing practise as the COO at QualityKiosk, Chitra Ramaswamy is a core member of the founding team and has set up the entire practice from scratch. With 30+ years of experience in IT sector, she has been instrumental in expanding the QualityKiosk footprint in various industry verticals and geographies. Known to be innovative and improving various processes deployed, she has led many ‘firsts’ in various domains, especially bringing technological evolution in quality assurance solutions and platforms, along with IT solutions development and consulting. Over the last few years, she has been involved in transforming testing practices and approaches internally and for customers from a DevOps and agile context integrating quality and speed. She is a post graduate in computer science from IIT Bombay and a ‘Certified Quality Analyst’ from QAI, and loves spending her leisure time reading, meditating and listening to Indian classical music. Q. How is it being part of a quality assurance company? How did it all begin? Born in a South Indian family in Ahmedabad, Gujarat, I always found my education and academics at the centerstage throughout my growing up years. My father’s passion and talent in mathematics rubbed off on me that led me to pursue B.Sc in Mathematics. Later on I got a degree in M.Sc. in Computer Science from IIT Bombay. After post-graduation, I worked at several firms such as A.F. Ferguson and Company, PRT System, Iflex Technologies and Silverline Technologies for over 20 years, before joining QualityKiosk (company founded by Maneesh Jhawar) in 2003. Q. How has the experience been so far? There is a great legacy attached to QualityKiosk. Maneesh started QualityKiosk in 2000 as his experience in the manufacturing industry made him realize that there was a huge gap in quality assurance when it came to software testing. QualityKiosk pioneered third-party software quality assurance in India. Earlier the developer would test and that was it! We changed that. We pioneered third-party quality assurance in India 18 years ago. It has been a roller-coaster ride. We are not just a testing company, we are Digital Experience Assurance experts. We take pride in being ahead of the curve by anticipating the ever-changing needs of our clients and their end-users. That said, it is always exciting to work with my team in a fast-paced and agile environment. I think it’s just not work – life balance. It is striking a work – life harmony. What it means is sometimes work demands more of your time and one needs to anticipate the workload and deliver and sometimes the personal front requires more time and attention and one needs to address that as well. Striking a work – life harmony will help individuals balance the critical priorities at work as well as at home. Q. What impact does your role bring about? At QualityKiosk my role as the Chief Operating Officer is to make sure that we delight our clients by continuously adding value and helping them achieve their business outcomes. Our philosophy is quite simple; we encourage our leaders and teams to bring new ideas to the table and execute them. Every QKite must possess the spirit to do new things. We have a dedicated research and development team that keep our technical edge in the market sharp. Our dedicated business consulting practice makes sure we are on the dot when it comes to changes in the market. Q. Thoughts on incorporating more women in new tech sectors. There is no difference between men or women as one can bring value to whatever one does. The mantra to success is bringing value to whatever role or responsibility that resides on your shoulders. Don’t tolerate mediocrity. Be better today, than what you were yesterday.